A simple tool (can run remotely) that was created to allow the toggling of Out of Office as well as the ability to change either the internal or external (or both if you so wish) out of office messages. Someone calls in sick but hadn’t actually signed out of the office PC. Lync status shows away. Requirement is to have the Out of Office status shown via Lync Presence to advise that a person was ill and thus out of office. Typically it would only really need the internal message to be set, added the external just as a convenience. 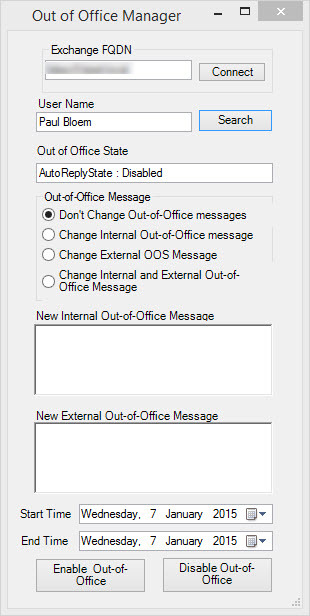 Click Enable Out-of-Office button – the Out of Office Message State should be updated once the settings have been applied. NOTE The Start and End date can not be the same day. Before you remind me..I am aware that this is do-able from OWA. Just wanted a SIMPLE Tool that could be used by e.g. Human Resources\Team Leaders etc. Do let me know if you can think of anything useful I could add to this little tool.